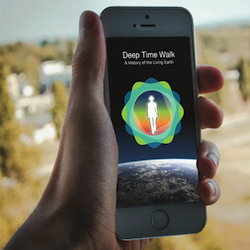 The Deep Time Walk is a ground-breaking project that addresses the mind-boggling, yet deeply anxiety-reducing, dimension of deep time by enabling anyone, anywhere, to experience a walking, audio immersion into the history of the living Earth. It’s taken about 4,600 million years since the formation of our planet for you, and everyone who shows up in your TV news, to be here. That’s an unfathomable amount of time to comprehend. Even the very brief span of our species Homo sapiens (roughly 200,000 years of existence) is difficult to put into perspective within the vast epochal periods of Earth’s big history. The Deep Time Walk is a smartphone app that leads you to walk 4.6 kilometers while listening to a dramatized dialogue between a “fool” and a “scientist.” Each meter walked (approx. 2 steps) represents a one-million-year segment of the journey from the Earth’s inception to the present day, thus offering an enlivening, visceral perspective of the oldest testament on Earth. Participants report that the Deep Time Walk evokes a profound shift in perspective, awakening them to our magnificent ancestry and the vitally important wisdom embedded in deep time. This new worldview is fertile ground from which innovative solutions to the many crises facing humanity can grow. Created by Geoff Ainscow and his team in Europe, the Deep Time Walk won the 2017 Platinum Award, the top honor given by the Best Mobil App Award for the United Kingdom. Now, take the walk of your life! Here’s a sneak preview!